Bright and spacious, the living room is perfect for relaxing after a long day of sightseeing. Comfy sofas, large flat screen TV with Freeview, and unlimited WiFi provide home comforts, and the dining area comfortable seats four guests. The large kitchen is well equipped, and features an oven with hob, large fridge/freezer, microwave, washing machine, and breakfast bar. Choose from two bedrooms, one double and one twin, both with plentiful guest storage. A modern family bathroom with bath over shower completes this delightful home from home. Outside, guests are treated to a well maintained private garden, and free off-street parking. 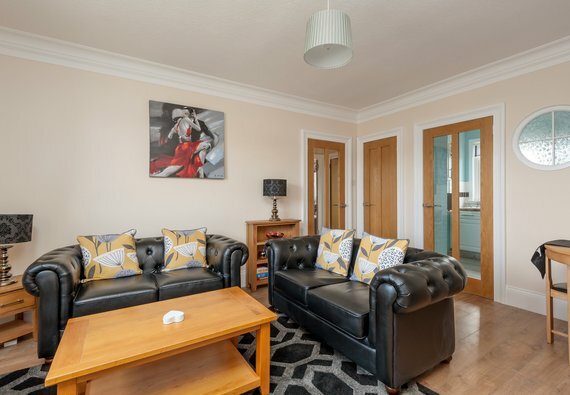 In terms of location, you are less than two miles from the Medieval centre of the Old Town, home to Edinburgh Castle, The Royal Mile, and the Palace of Holyroodshire. The New Town, famous for Georgian architecture, galleries and independent delis and eateries. Leith and The Shore, lined with delicious bistros, bars and a Michelin star or two, is just one mile away. Many buses servicing the whole city run from Sleigh Drive, just around the corner. Interior layout A central hallway leads to a living/dining room with kitchen off, two bedrooms, and family bathroom. No reviews yet for The Findlay Gardens Residence.